Description	 MS in Latin on walrus ivory, Kent, England, 1st half of 11th c., 1 seal matrix, diam. 4 cm, 5,4x4 cm, 1 line in Anglo-Saxon capitals, 3/4 length figure of a man, a sword in his right hand, facing left and pointing with his left hand; the handle carved with a bird-headed dragon intertwining with its bifurcating tail. Context	 This is one of five surviving seal matrices from before the Norman Conquest. Provenance	 1. 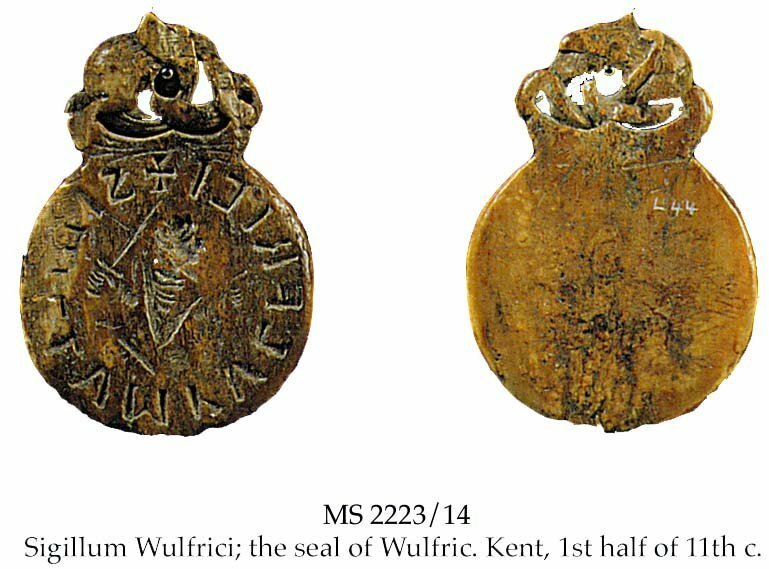 Wulfric (11th c.); 2. Discovered in a garden shed in Sittingbourne, Kent (1976); 3. Christie's 16.3.1977:179; 4. British Rail Pension Fund (1977-1996); 5. Sotheby's 4.7.1996:1. Commentary	 The seal was probably made for the use by a secular person of rank, possibly a thegn (noble) of King Ethelred II. Published	 1. Janet Backhouse, D.H. Turner, Leslie Webster, eds. : The Golden age of Anglo-Saxon art 966-1066, p. 114, no. 113; 2. Elizabeth-Ann Hastings, "An Anglo-Saxon Seal Matrix", Burlington Magazine, vol. 119, 1977, pp. 308-9; 3. T. A. Heslop, "English Seals from the mid-ninth Century to 1100", Journal of the British Archaeological Association, 133, 1980, pp. 6-7; 4. English Romanesque Art 1066-1200, Hayward Gallery Exhibition, 1984, p. 317, no, 369; 5. J. Cherry, 7000 Years of Seals. ed. D. Collon, British Museum, 1997, p. 133, fig. 8/3; 6. Manuscripts in The Schøyen Collection, ed.-in-chief, Prof. Jens Braarvig. vol. IV: Medieval seal matrices. Ed. by Richard Linenthal and William Noel. Oslo, Hermes, 2004. Exhibited	 1. British Museum, 1977-1996. 2. Hayward Gallery, London, March- July 1984.